Availing me thy faculties well known. But could not life breathe into it alone. Imagining scorn that I make so bold. Thy zeal and delight are joys to behold. I’d never thought to hold such treasure. I now admire with boundless pleasure. By off’ring me a part in thy design? That thou hast need of talent such as mine? With lavender thick, and lily and rose. My skills do refresh, and so too my nose. Than ever dwelt in my conceiving. Are rich indeed beyond believing. 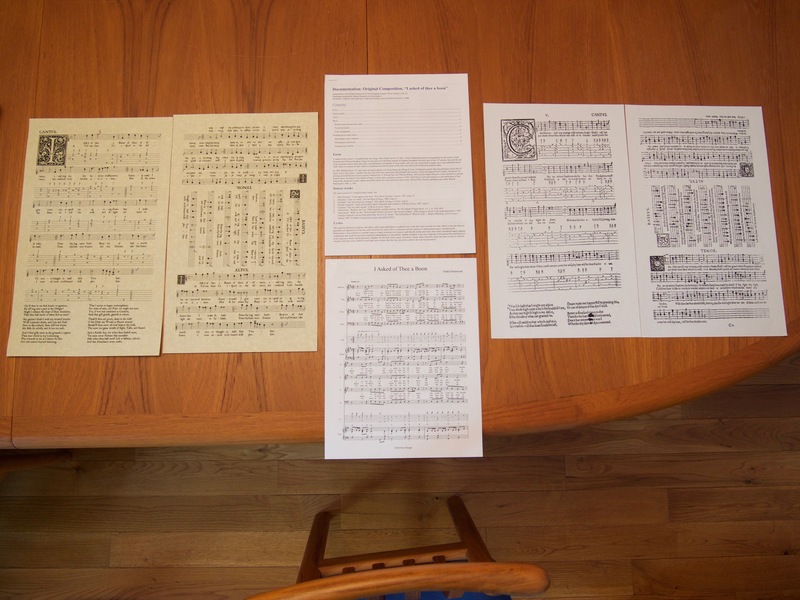 Document, compose, and perform a composition using a musical form from prior to 1600. (Master Peregrine the Illuminator) – I encourage both sung compositions and played compositions. I encourage working with other musicians to perform multi-part works, working with poets to create new words to fit sung compositions, and working with calligraphers/illuminators to notate the composition in an authentic manner. I ask that a copy of the research, composition (in modern notation), and copies of the works that inspired yours be provided to me two weeks before the event, that I might properly study it before discussing it with you. Your documentation should include copies of similar works (or parts of works) composed prior to 1600, to show the form you are using. Early on in my year of study with Maistre Lucien, part of my “compleat bard” personal goal list got more specific: I was going to learn how to compose original period-authentic songs for my persona. I developed a taste, and then a passion, for Elizabethan music, and the lute song (or “ayre”) in particular. 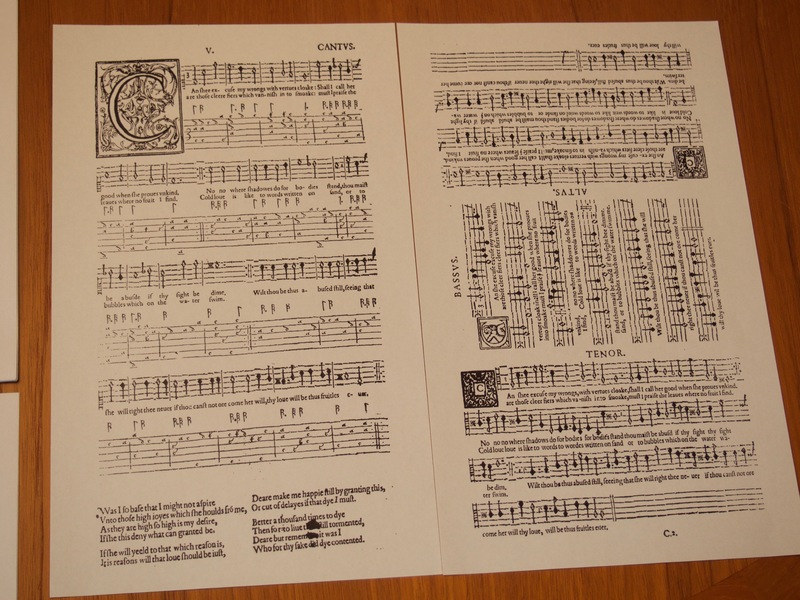 I began to seek out primary sources: lute songbooks by Dowland in facsimile. (Campion is harder to find, to my great annoyance, but I managed to get a number of his pieces in original facsimile as well. More on that another time.) Listening to, and looking at, this intriguing, elegant, elaborate music, the vision began to form. A song for the lute and multiple voices by the Elizabethan composer, Drake Oranwood. Complete with a two-page folio arrangement out of his long-lost First Booke of Ayres for Lute and Voice. It took the better part of three years to get to a place where I could realize that vision. A large chunk of that was learning more pieces, and teaching myself to play lute on guitar. I can play half a dozen pieces using lute tuning and fingerings now, at varying levels of competence (which was my baseline goal). December’s immersion Elizabethan event gave me a crash course in how choral harmonies were written in period, which meant this was actually much closer to reality than I’d realized. The tune I ended up adapting from an assignment from Lucien. Of course, making this happen would involve working with multiple performers. But the last few years as a recording artist and a concert performer had helped me develop a network, and an understanding of how to enroll people in a project. Crucially, I had learned that asking people for help in doing what I couldn’t do by myself was almost never received as an imposition or begging. I was inviting them on an adventure, a treasure hunt, and asking them made them feel seen, appreciated, and valued. And the treasure we found together would be something everyone could share in. Hmmmm. That sounded like a really great theme to write a song about. I asked Donal Artur of the Silver Band (aka Don Levey), whose willingness to play my music on his guitar had given me the first hints of what was possible if I asked for assistance back when I had first considered becoming a bard. Inviting him to stretch himself, and learn a lute piece, was a challenge I suspected he’d relish, even if it made him nervous (as it had me). But with his greater baseline skill, I trusted he would learn it in the two months between when I finished my lute arrangement and the performance. My three vocalists I invited quickly from the Feast of St. Nicholas choral group: Sólveig Bjarnardóttir had directed the choral work, and is an outstanding soprano; Gwenyn Llewelyn, Sólveig’s friend and an excellent alto, had assisted her in running our rehearsal at that event; and John Fitz Thomas had shown quick aptitude for the bass parts. I finished the sheet music, and reached out to Isolde de Lengadoc, who had twice provided me with vocal tracks remotely, and asked for assistance. Once again, she took the time to learn the female vocal harmonies I had worked out, and recorded them as learning tracks for my performers. I had a (very) rough recording of the first verse of the song, which I could re-mix for each part with that part emphasized so they could hear it clearly over the others, and distribute it. With luck, everyone would have a solid five weeks to learn their parts, and be ready to polish it up together the day of the event in time for performance. And our luck suddenly kicked in, when I spotted Leonora on my FB Messenger list. I’d met her last Pennsic, and her pipes and competence with late period material were mind-blowing. She had only been playing with the SCA for a few years, and she was looking to find opportunities here but hadn’t shown up on anyone’s radar yet, so she probably wasn’t going to be at an event. Would she be free that day, and willing to take this on? She was, and she was! It was going to be a challenge, as she would be flying home from Indiana late the night before the event and have to get up early to travel from New York to Boston, but liked the piece and was eager to help. And then, on Thursday, Gwenyn let me know that she too had gotten sick and her alto voice was gone. I scrambled for a moment, and realized that the solution was closer than usual: Cedar. Cedar whom I’d just convinced the day before to come to the event so they could check it out. Cedar the fearless, the nimble, the quick study, the alto. Would they take this on with two days to prepare? Of course they would. Because Cedar. Luck had one last test of our dedication to the project: Friday night, Leonora messaged me that she had (through no fault of her own) missed her connecting flight home and gotten stranded in Chicago, with no prospects for further flights that evening. As I sat and kept my fingers crossed, prepared to scrap the soprano part and sing the second and third verses in my tenor range, luck apparently had a chance of heart. A rerouted plane magically appeared bound for New York, and Leonora managed to sweet-talk her way onto the flight. She would be there. Peregrine pointed out that in my documentation (which you can find at the top of this page), I neglected to include acknowledgments for those who gave me key knowledge, or a bibliography of secondary sources. Let me address that here. My first teacher, Maistre Lucien de Pontivy, set me on the course of loving Elizabethan music and striving to re-create it. The tune for this piece originated from one of his assignments to me. When I first started with him, I struggled to answer his queries about what I thought of the melodies and harmonies he was asking me to listen to, and I shrugged and told him: “I understand basic music theory, but I live in the lyrics.” After our performance, Lucien came to me and let me know that he had wept each time the choral dissonances I had written resolved themselves at the end of the line. I gazed at him, ever touched and fondly, and it hit me what had happened. “I lived in the music, didn’t I?” He nodded, and no acknowledgment has ever been sweeter. While Sólveig Bjarnardóttir was not able to perform this piece, she was instrumental in making it possible. Digging into Elizabethan choral arrangements under her guidance, and seeing her work through integrating the singers the day of the performance, were crucial to my understanding of the voice part of the puzzle, and her leadership at the St. Nicholas event provided both for me. My Laurel, Mistress Zsof, proofread my documentation and gave me terrific feedback about how to improve it, be less stingy around page space, and make it easier to read. Watching people pore over my documentation as they passed by my display was a subtle pleasure of doing A&S work I hadn’t quite anticipated. Master Peregrine gave me a ton of rich feedback from his graduate work in music. He was greatly pleased with the time and detail that went into developing the piece, transcribing it, and documenting my process. The one area that he invited me to spend time learning more about was counterpoint. He provided me documentation around the rules of counterpoint for Renaissance choral music, and a detailed analysis of the amount of dissonance I employedin my choral arrangement. He is correct that I played with dissonance in this piece to a degree I have never attempted before, and certainly Dowland did not let dissonances linger for the long stretches I chose to ride them in my piece. As I strive to more closely emulate the works from my persona’s period, a more formal understanding of these rules will be invaluable to me. He also admitted that, contrary to his concerns as he had studied the notes on the page, that in performance it had managed to balance beautifully, and did not interfere with his enjoyment of the piece. And I’ll admit, I had the same concerns, and for now have come to the same conclusion about this particular song. The Bodelian First Folio, http://firstfolio.bodleian.ox.ac.uk/. Oxford University’s digital facsimile of the Bodelian Archive of the First Folio of Shakespeare’s plays. It is comprehensive, and searchable by word. It turns up variants and variant spellings of the word throughout Shakespeare’s works (but, when searching for a word with a u or a v in it, remember that they were the same letter in Shakespeare’s day, and you have to spell it accordingly: it appears as a v as the first letter of a word, and a u anyplace else). Invaluable as a source to examine how Elizabethan English words were spelled and appeared in print, and indeed whether they had the same meanings 400 years ago as they do now. The Choral Public Domain Library, http://www2.cpdl.org/. A fantastic and searchable resource for sheet music. The Petrucci Music Library, http://imslp.org/. Also a fantastic source for public domain music, they have a great deal of period transcriptions, including full original facsimiles of Dowland and others. 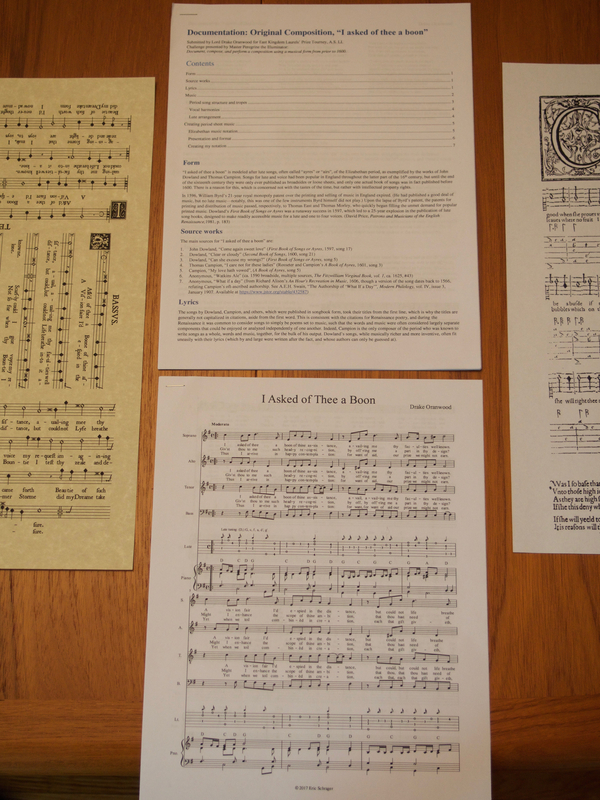 A good guide to Renaissance mensural notation can be found at http://www.pdreditions.com/MensuralNotation-1.html. My Laurel instructed me not to cite Wikipedia as a source. Her point is valid, since the quality of information varies wildly, but as a launching point for understanding new topics it can be invaluable, and most articles have links to secondary or tertiary sources that may help you further. To disparage this project as a source of information outright seems to me a disservice to the thousands of people, most of them fairly well-informed, who share and consolidate their knowledge on a volunteer basis. MuseScore 2.0, free music notation software which I used to create all my sheet music (and which supports early music instruments including lute tablature), can be downloaded from https://musescore.org/en/download. It doesn’t produce mensural notation (there are more expensive packages that can do that), but there’s a ton you can do with it with a bit of practice. You can export scores to PDF, image files, MIDI, and MusicXML, and it can import from MusicXML or MIDI. 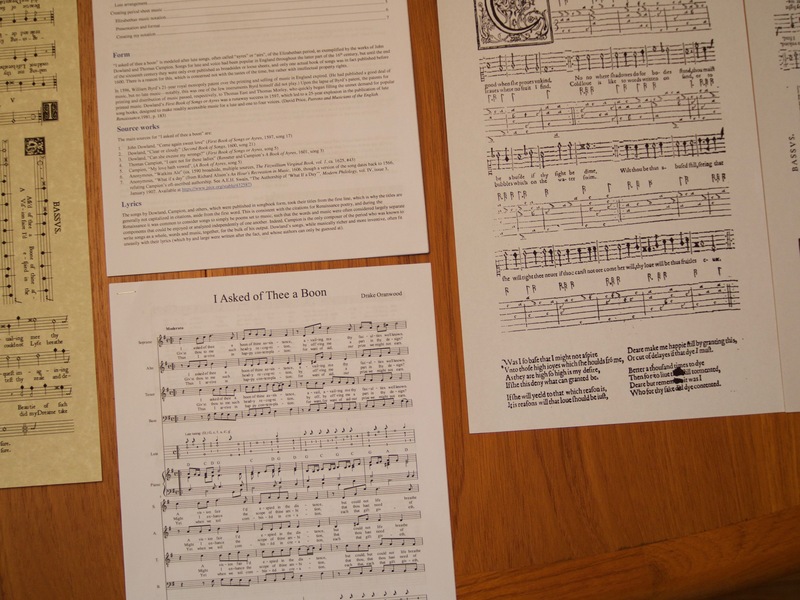 Biertab, from Beier Lute Software, is also free, and a powerful tool to create lute tablature specifically (downloadable from http://www.musico.it/lute_software/). 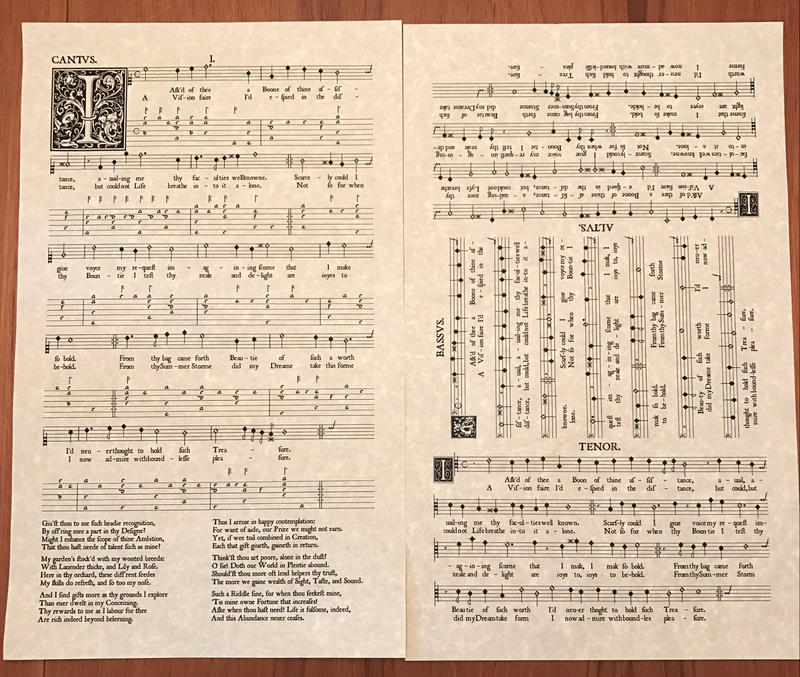 The tablature itself is a bit clunky to look at, but it is in some ways more flexible and powerful than MuseScore, and made for a useful first step. Happily, it allows you to export a score into MIDI, and you can import the result into MuseScore, which is what I did.